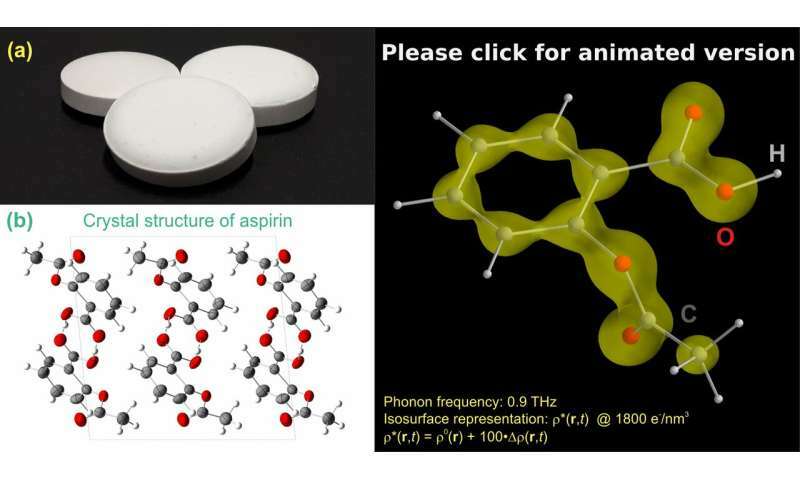 Aspirin is not only an important drug, but also an interesting physics model system in which molecular vibrations and electrons are coupled in a particular way. For the first time, X-ray experiments in the ultrashort time domain make electron motions visible in real time. They demonstrate that very small atomic displacements shift electrons over much larger distances within the aspirin molecules. Aspirin pills (Figure 1a) consist of many small crystallites in which molecules of acetylsalicylic acid form a regular spatial arrangement (Figure 1b). The molecules couple to each other via comparably weak interactions and generate electric fields which exert a force on the electrons of every molecule. Upon excitation of molecular vibrations, the distribution of electrons in space and, thus, the chemical properties should change. While this scenario has been a subject of theoretical work, there has been no experimental demonstration and understanding of the molecular dynamics so far. Scientists of the Max Born Institute in Berlin, Germany, have now gained the first direct observation of electron motion during a coupled vibration of the aspirin molecules. In a recent issue of the journal Structural Dynamics, they report results of an X-ray experiment in the ultrashort time domain. 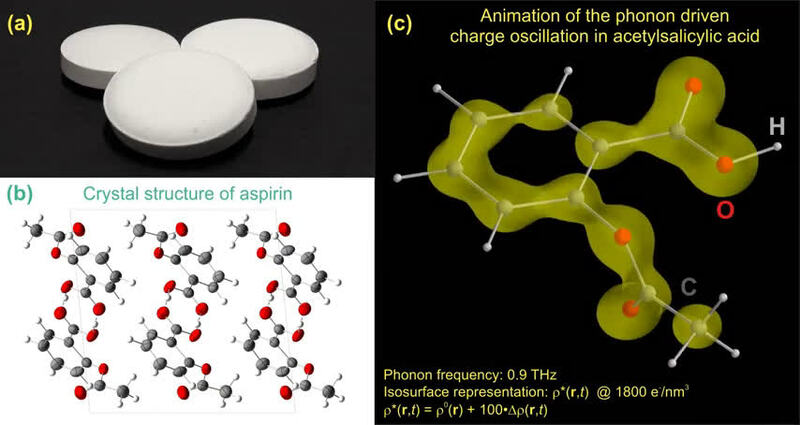 An ultrashort optical pump pulse induces vibrations of the aspirin molecules with a vibrational period of approximately one picosecond. An ultrashort hard X-ray pulse, which is delayed relative to the pump pulse, is diffracted from the excited powder of crystallites to map the momentary spatial arrangement of electrons via an X-ray diffraction pattern. The animation in Figure 1c shows the rotational motion of the methyl (CH3) group of an aspirin molecule which arises upon vibrational excitation. In the animation, the atomic displacements are artificially enlarged to make them visible. The methyl rotation is connected with a spatial shift of electrons over the entire aspirin molecule (yellow clouds, so-called isosurface of constant electron density). The periodic electron motions occur in time with the vibrational motions of the atoms and the distances traveled by the electrons are typically 10000 times larger than the atom displacements in the methyl rotation. This behavior demonstrates the hybrid character of the methyl rotation which is comprised of both atomic and electron motions on totally different length scales. The hybrid character originates from the electric interaction between the aspirin molecules and the dynamic minimization of electrostatic energy in the crystallite. These new results emphasize the central role of hybrid modes for the stabilization of the crystal structure, in agreement with theoretical calculations. In the case of aspirin, this property favors the so-called form 1 of the crystal structure compared to other molecular arrangements. The strong modulation of the electron distribution by vibrations is relevant for numerous crystal structures in which electric interactions prevail. Vibrational excitations of ferroelectric materials should allow for an ultrafast switching of the macroscopic electric polarization and, thus, lead to new electronic devices for extremely high frequencies.